As the change of seasons rapidly approach, some may experience the blues. Rather than being sad about seeing the warm temperatures leaving, get excited about dressing your home up in some fabulous blues! 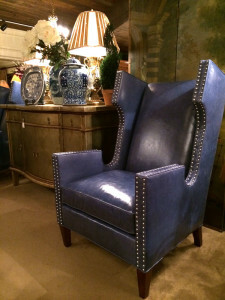 CR Laine, EJ Victor, Henredon, and Hancock & Moore all have some amazing blue furniture that will give the “change of weather blues” a whole new meaning this year. By Ryser's Furniture| 2013-10-23T18:17:21+00:00	October 23rd, 2013|General|Comments Off on Change of Weather Blues??? High Point’s Fall Market was GREAT! We have just returned from fall market and we are so excited! So many of our favorite companies had wonderful new introductions. For example, Henredon had three beautiful new collection introductions. Montaigne, a mid-century French inspired look, Acquisitions Euro with a range of European traditional styles and Acquisitions Contemporary which features Asian and organic influences. To get a sneak peek look at Henredon’s new lines, check out their blog post. By Ryser's Furniture| 2013-10-21T19:40:31+00:00	October 21st, 2013|General, News|Comments Off on High Point’s Fall Market was GREAT!